Director Anil Radhakrishnan Menon says he has a bucket list in place. Topping it was the desire to direct a film. That movie, North 24 Kaatham elevated the ad filmmaker turned director into the league of the true craftsmen in Malayalam cinema. It also fetched the National Award for Best Malayalam Film trumping several heavyweights. Before the film happened, Anil was going with the flow, working on ad fi lms, harbouring cinematic ambitions and yet doing little to make them happen. An incident, that he prefers not to speak about, had him relook life from a new perspective. “I didn’t want to look back on my life and regret about not doing the things I wanted,” says Anil, soft-spoken and rather measured in his words. So he quit his job in Pune and returned to Kerala to try his hands in movies. But North 24 Kaatham was not the debut he had planned. He had been working on the script for a Tamil film, and also had the seed of his new film Sapthamashree Thaskaraha alive and ticking in his mind. The story of a man fighting obsessive compulsive disorder had its moorings in Anil’s personal life too. ‘Everyone has his or her streak of obsessions,” observes Anil. He says has a cleanliness streak and does not cherish flying as it tends to make him claustrophobic. But then, for someone who dreams of travelling, taking that long flight to a destination he loves is also on his wish list. With established actor-stars including Prithviraj, Asif Ali, Joy Mathew and Nedumudi Venu, in addition to a crop of non-starry talents such as Neeraj Madhav, Chemban Vinod and Sudheer Karamana, Anil pulled off what is perceived as impossible in mainstream Malayalam cinema – giving room for everyone to shine. The film also has Dubai-based talent Reenu Mathews on the female lead, as well as director Lijo Jose Pallisseri in a delightful cameo. Anil says he did not have Prithviraj or Asif Ali in mind when writing the script. In fact, several other actors were considered in the film’s planning. And even when Prithviraj came on board as producer, there were no revisions to the script to accommodate his stardom. “Raju in fact went beyond the call of his duty as actor, and was even involved in stunt direction as that is not something I know of,” says Anil. 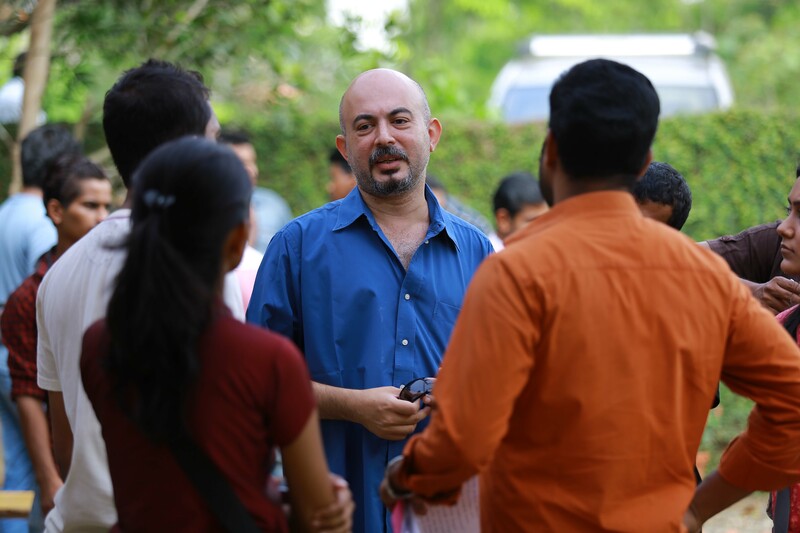 Anil, who hails from Ottappalm, uses the Thrissur dialect for the movie. “There is a lyrical quality to the dialect, and even more importantly, there are subtle variations to it when you travel through the breadth of the district. And then there is the manner in which people in Thrissur take control of a dialogue with absolutely no ambiguities.” Anil says he was helped by Lijo in polishing the slang. Sapthamashree Thaskaraha has now emerged as the Onam festival winner, repeating the triumph of North 24 Kaatham, which was released during the same festival season last year. Both the films have triumphed over big budget extravaganzas, more so in capturing the minds of viewers. A heist movie, which is rare in Malayalam cinema, Anil brings a liberal dose of humour and satire that has become its forte. “In fact one of my all-time favourite movies is KG George’s Panchavadipaalam,” he adds. He says his favourites in Malayalam film are George, Mohan and Sathyan Anthikadu, as well as movies scripted by John Paul. Although he was familiar with the techniques in filmmaking, he spent time on the sets of Chappa Kurishu and Ustad Hotel, and Anil feels that his friendship with Sameer Thahir and Anwar Rasheed, among others, is his biggest asset. He has made no plans about his next movie, and is now taking time off. As for what next on the bucket list, he is not to reveal it for now. And if you could make a prediction about his next movie, you could bet that it too would be feel-good. That is what Anil likes too.